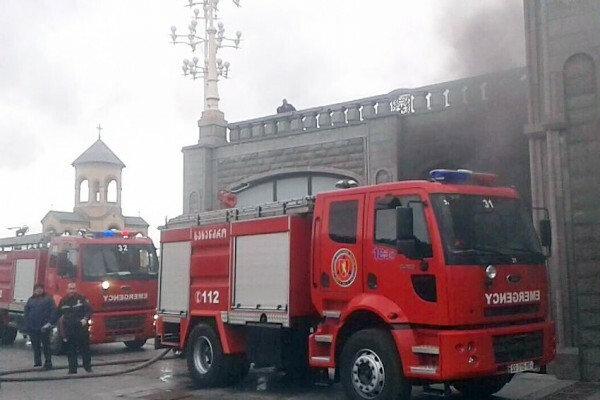 Tbilisi, March 21, Interfax - Fire has broken out at the St. Trinity Cathedral, the main cathedral of the Georgian Orthodox Church, in Tbilisi on Sunday. The fire-fighters had to work in hard conditions. No people were injured. The fire has occurred on the ground floor of the cathedral, which houses a printing office, and the heavy smoke has enveloped the whole building and the adjacent area that made the fire-fighters and rescuers urgently evacuate all believers and clergymen. Clergymen said that the lower storey of the cathedral housed the youth educational center, the printing office, as well as the utility rooms and the storage sites with secondhand clothes intended for the distribution to poor people.